On October 25, 1997, an estimated 750,000 African American women gathered together to march on the Ben Franklin Parkway in Philadelphia to focus on their trials, circumstances, and successes. The day-long march and program of prayer, music, and inspirational speeches, which began at the Liberty Bell and ended on the steps of the Philadelphia Museum of Art, sought to bring together African American women to address the pressing issues of interest to them and to black families. Some of these issues included the economic deterioration of African American communities, the importance of nurturing young children in a positive environment, finding a collective voice in politics and the civil rights movement, and strengthening black families. The march was designed to inspire African American women across the nation to work for their own improvement as well as that of their communities. The march, which was organized by Phile Chionesu and Asia Coney, two Philadelphia grass roots activists, was a huge success despite short notice and few preparations. The organizers bypassed traditional leaders such as Rev. Jesse Jackson and organizations such as the National Association for the Advancement of Colored People (NAACP) and the Nation of Islam which had been influential in organizing the Million Man March in 1995. Using a network of women’s organizations and relying on fliers, leaflets, black-run media, the Internet and “word-of-mouth” to spread the word, the organizers brought women from across the country to Philadelphia via plane, train, bus, and other means of transportation. An estimated 125,000 women arrived from Chicago and New York. Unlike the Million Man March two years earlier, the Million Woman March did not rely on big names or the celebrities of the civil rights movement to fuel attendance. Nonetheless several influential black women attended and spoke including Winnie Madikizela-Mandela, former wife of South African President Nelson Mandela, and California Congresswoman Maxine Waters. Michael Janofsky. 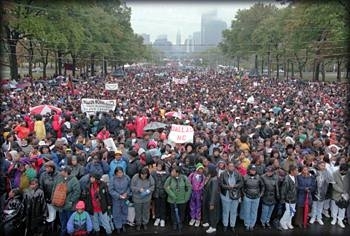 “Million Woman March is Set with High Hope.” New York Times (October 23, 1997); http://partners.upenn.edu/wp/k12/wphs/qwest/ne1.htm.